I just love our bedroom! After a long day this is the place where I get comfortable and totally relax.To most the bedroom has become more than just the place to sleep. It is where we are watching TV and read. It is where we are our true selves, where we enjoy our private time alone or with a loved one, and the kids, and the dogs. There are many factors to consider when choosing the lighting for this very personal space. Choosing the right bedroom lighting plays a major role in how comfortable you feel, not to mention your ability to choose matching socks. Most bedrooms have a central ceiling light that is often asked to light the entire room. But you really can't make one type of light serve all the purposes of reading in bed, getting dressed, etc. Just like any other room in the house, the bedroom benefits tremendously from the use of multiple light sources to create "layers of light". Table lamps, wall sconces and floor lamps can all add to the overall feeling of comfort. 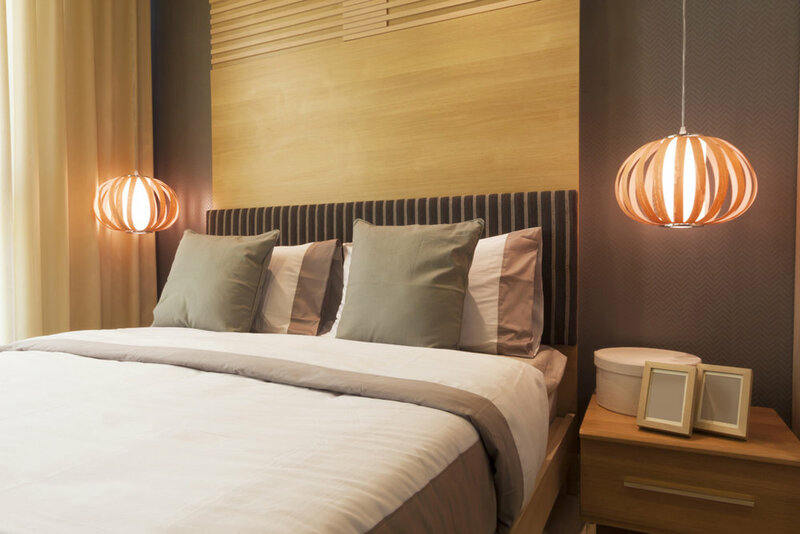 After the general lighting you turn on when you enter the room (recessed, ceiling mounted or a ceiling fan), good bedside lighting is a priority in a bedroom. Even as an ebook reader I like to have a light I can turn on from the bed. These lights can be a great excuse to add something fun and unique to accessorize your room. Table lamps on bedside tables or nightstands are a classic option that adds a sense of symmetry and balance to a room. So, how tall do bedside reading lamps be? I hate to give this answer, but it's true: It depends. A lot depends on the scale of the room. An oversized master bedroom suite with high ceilings and a king size bed with a tall headboard can obviously handle larger scale table lamps next to the bed. A small intimate bedroom with small side tables will need a different scale to look balanced. Low modern beds with low nightstands are yet another issue. Yet, it all boils down to functionality. You want to be able to read comfortably without glare. Here are some general rules of thumb: If your nightstand is 24" to 30" tall, your lamps should be at least 27" – 32" tall. Low, modern style night stands that are only 18"- 20" off the floor call for taller lamps for comfortable reading. Swing-arm wall lamps are another option for bedside reading lamps since they doesn't take up space on the bedside tables. It is important to mount them at the correct height. The ideal mounting height gets light on the pages you are reading. The best way to find the mounting height for your situation is to get into bed in your normal reading position. The bottom of the shade should be just above your shoulder height. OK, so you like reading sitting up and your partner reads lying down. How is that going to work? Hanging the bedside sconces at different heights on the wall would obviously not work. This is where swing-arm wall lights that adjust both vertically and horizontally come in. The Tolomeo wall light in the photo below comes in a large variety of sizes and with longer arms than shown here. It is one of my favorite choices because of its flexibility. Another way of providing light for reading in bed is using pendants. Pendant lights have the advantage that they don't take away space on the usually too small night stands. It is just critical to get the hanging height right and to choose pendants that don't just focus the light directly down onto the surface below, but spreads it through the shade. Recessed lights by themselves are not ideal reading lights. The light has to travel too far a distance to be effective unless you use a wattage that will really put your bed in the spotlight. In new construction bedrooms are getting larger. Some now have sitting areas or incorporate a mini-gym with work-out machines. Treat each area as a separate room and provide lighting that works for each specific area. Through the use of multiple layers of light and by creating pools of light for different tasks (another lighting design term) the overall effect will be warm and inviting.